How to enter records with keys to an initially empty B+ tree? Show the result of entering the records with keys in the order (1, 2, 3, 4, 5) to an initially empty B+ –tree of order m = 3. In case of overflow, split the node and do not re-distribute keys to neighbors. Is it possible to enter the records with keys in a different order to have a tree of less height? each node has at most (m-1) keys and at least (⌈(m/2)⌉-1) keys unless a key can be empty and I would understand the key as a "pointer". Note that the growth is at the top of the tree, and this is an intrinsic characteristic of a B–tree to ensure the important properties that it always have all the leaves at the same level, and each node different from the root is at least 50% full. The exercise is for m=3, so at most 2 keys per node. I'm going to use ASCII art. I'll label each page in the sequence they're created and show the keys/ pointers within the page. So page P containing key values k1 and k2 will be P:[k1,k2]. the pointer to [the new node], .. is inserted into the father node .. of [the current node], repeating the insertion operation in this node [i.e. the father node]. This splitting and moving up process may continue if necessary up to the root, and if this must be split, a new root node will be created .. I have the pointers in non-leaf pages pointing to the highest value in a child (son) node. Your linked text may do this differently but the result will be equivalent. As for the second part -- "Is it possible to enter the records with keys in a different order to have a tree of less height?" 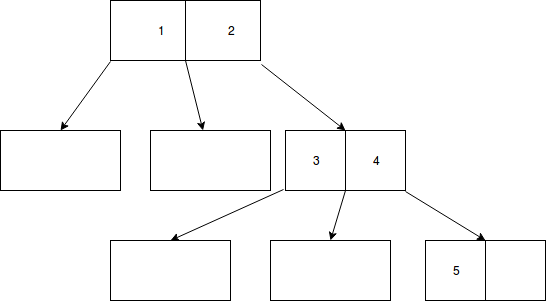 With 5 keys and two keys per node we need at least 3 leaf nodes to hold all values and a height of 3 to form the tree. So my arrangement is optimal for the given data, sequence and algorithm. The book uses a very different pointer arrangement to what I use, and a different page split arrangement. This will be significant, leading to part-full pages. That there is a section on page 42 called "Data Loading" that shows how fuller pages can be achieved by loading out of key sequence supports my hunch. However, I hope I've given you sufficient pointers and you'll be able to use the book's pointer structure to work that out for yourself. Not the answer you're looking for? Browse other questions tagged btree or ask your own question. How many B-tree indexes do I need to support lookups by any subset of n columns? How can we foresee (and configure) B-Tree and R-Tree indexes width and depth in PostgreSQL?